Ready for my grandbaby with this amazing carseat! This is my second Chicco car seat. I had to replace the first one because the car seat had expired by the time my third child was born. I didnâ€™t even hesitate and went straight to purchasing another Chicco! Love how there are more options of colors now than there were 8 years ago! ConsThe canopy seems cheap, isn?t as sturdy as it used to be. This is the second Chicco car seat that I bought for my daughter. I bought the whole system for my 1st grandbaby 6 yrs ago and daughter used for 2nd one (2yrs ago) but we canâ€™t for 3 rd baby for the seat although in excellent condition has expired. My daughter and son in law are thrilled that this one will fit the stroller from first and now have 2 bases. We been through many car seats but this is our absolute favorite infant car seat. 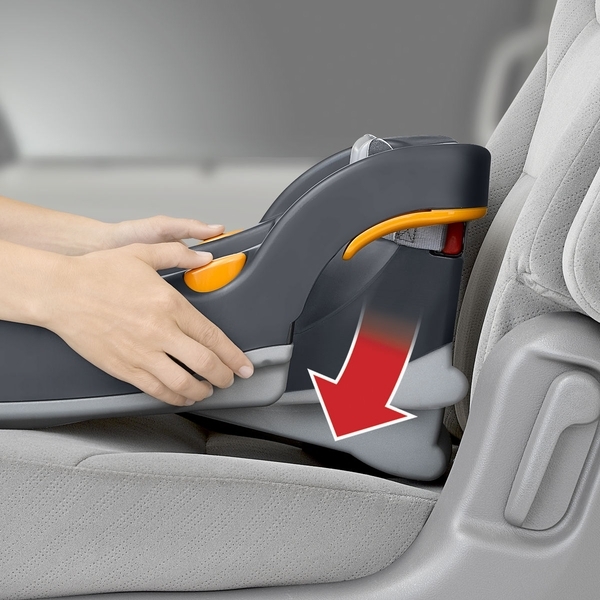 ProsEasy to move infant seat in and out of car. Snaps in securely. Great fit for 1st year. Easy to wash.
ConsOnly wish it could be used for longer. However all infant seats are like this. Best to use infant seat versus a grow car seat for newborns. Grow seats don?t seem to be as good a fit for infants. I have had this car seat for almost two years now and I'm getting ready to use it with my next child due in a couple months and I couldn't be more excited. I LOVE the base system and how easy it is to take in and out of the car. I'm also a huge fan of how easy it is to take apart and clean! If you are contemplating getting the KeyFit Caddy with it, do it!!! It's a total game changer. Overall I'm very happy with my purchase and will always stick with Chicco! Highly recommend!!!! I bought this car seat for my grandson. I love the zipper cover especially in the cold New England weather. It is east to click and remove from the base. Absolutely love this car seat. So stylish and cute! With my baby coming in the next couple weeks this will work well with the cold weather. Cover up is easily detachable and easy to wash. Love the color and feel. Fits perfect with my bravo Q collection stroller. Highly recommend. The seat is super soft and has plenty of cushion. The safety features alone make it worth it but add in the comfortableness for the baby and it's one of the best purchases I made. 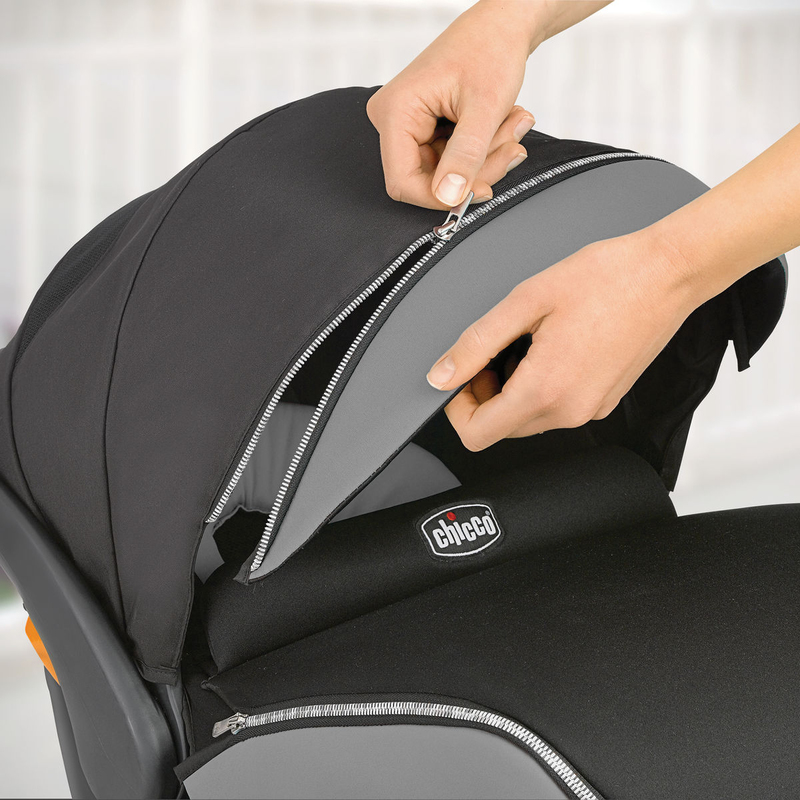 The Chicco Keyfit30 is very easy to use, both with the base and using a seatbelt buckle if you are traveling without the base. The straps loosen and tighten easily; the cover easily removes for washing; and safety features are of course top notch. The one thing to note is the baby may outgrow before 30 lbs, just based on length and chunkiness. My baby outgrew at about 24 lbs at 6 months. Also, it is pretty big, but most seats these days are. It fit behind the front seat in my 2007 Subaru Forester, but the front seat had to be all the way forward. I would recommend this seat. This product is above and beyond what we expected. I purchased it for my new granddaughter. It will be perfect for her. I am a new mom (baby isn't due until April 1st), so I am brand new to the world of car seats. I did quite a bit of research before purchasing a car seat and ended up with this one for a few reasons. 1) The liner is removable for washing. 2) Chicco consistently gets excellent safety ratings. 3) I really liked the added zip features. I think it will make removing the canopy and adding/removing the foot warmer much more convenient. Great promotional discount through Albee. Fast shipping of product. Colors are true to internet image; dark navy with silver/blue/green accent color for the "midnight" model. Have not used product as of yet since baby not due till march. Was worried about easy access of buckling baby in and out of carseat with zipper boot, but easy to take on and off along with unzip. Feel it will be a nice bonus so blankets stay put during cold months. Very stylish but overall my newborn fits super comfortable in it. She looks so cozy and warm in it and her heads not bopping around like other car seats. She has much needed support and I just love it! So happy with my purchase!! I love that it has the cover since my baby is to be winter baby this will help keep him warm and cozy. I love the pattern I got and the material looks very durable. Excellent Quality, beautiful color... Baby loves it!! Fast shipment, easy ordering process. This car seat was perfect for my beautiful granddaughter. Love the carseat itself but was a bit disappointed in the color. I know it's supposed to be a light violet but it just looks gray with a barely there violet tint only in certain light. Wish I'd have stayed with the teal color I originally chose. 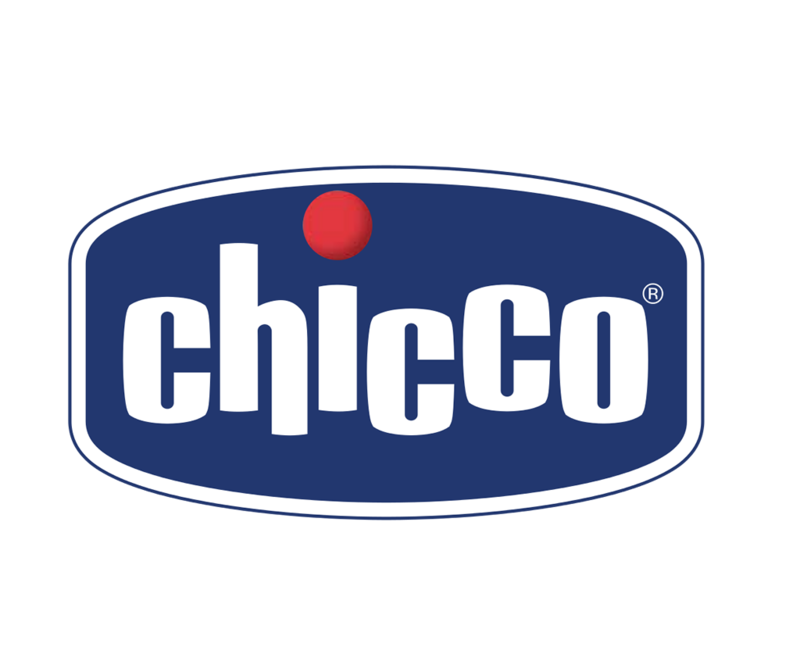 Chicco is the best brand! I love this car seat! It is so stylish and comfy for my little man. I love how easy it is to install the base in the car. 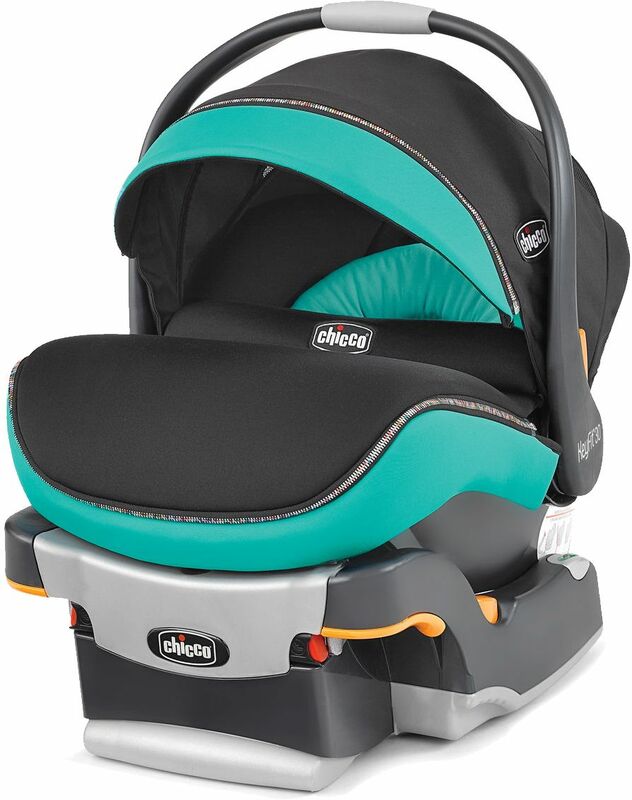 The car seat is easy to click in and out of the base and Chicco Bravo LE stroller. Another great feature is how easy it is to take the car seat pieces off and wash! Very sturdy and great quality! I also love that this car seat comes with the infant insert, shoulder pads, and padded headrest. Great material! I will definitely continue to use Chicco products. I received this by mail as an item off my registry, and I was so disappointed when I opened it that the breathable mesh that gives it the name "air" only goes halfway up the back. All the models I have seen in store and even on the packaging and tags of the one I received show the air mesh all the way up the back. I opened it on a Saturday so I will have to wait to talk with customer service to see what we can do. Got this for 20% off, which made it cheaper than the base Keyfit model. Baby hasn't arrived yet so can't comment on functionality, but the materials are such a nice upgrade from the base model. The seat fabric is smooth, not rough and crinkly. The newborn insert is much nicer as well. The serene color is subtle and classy and gender neutral, and the sun shade works well (a common complaint you'll see on the base model). I ordered my daughters first seat with Albee Baby and was so pleased, especially with prices, I decided to order my second child's seat here as well! We are first time Chicco purchasers and are beyond impressed with this carseat! The carseat is extremely easy to install and gives us the safety and piece of mind we needed for our newest bundle! We have always purchased Graco and Britax in the past but this time I really did my research and couldn't be happier with our decision! ProsSimple to install and lightweight, also the fabric is soft and comfortable and easy to clean!Even the seat belt buckle is covered in soft plush fabric!! I bought two of these for my twin granddaughters due in June! Exactly what my son and daughter in law wanted! And the price with a special was super!! Will buy from Albee Baby again!! We already had two boys and thought our family was done. Low and behold, 5 years later a little girl would grace us with her beauty. Our families threw a shower for our first born and do not believe in multiple showers. I researched seats and Chicco was my top choice. A family friend shared with me her love for this seat because of the foot cover. Being that our girl would be a winter baby...that was all we needed! I didn't care for the multiple blankets packing in around a baby whom would cry for the entire drive getting too warm(our experience with both our sons seat). This seat offered the wind and other weather protection our baby needed. We still used a blanket to shield the cold breeze from her face, but it was nice to know the majority of her was concealed from the elements with the foot shell. She is about to transition out of it. I am currently saving up to get a nextfit zip in starlet as her name is Scarlett(close enough) and I have most everything of hers in purple thus far. Her room is even purple with butterflies as the Dr shared with us that purple butterflies are the silent indicator of a loss from a multiple pregnancy(we lost her twin very early in the pregnancy). I feel safe with Chicco products. And I will spread the love to all new moms. The latch system is thee best most assuring way to properly install a seat. Easy switch from car to car. Knowing that the harness and tightener facets on the car seat are easily maneuverable, make me feel more comfortable and at ease when it's just me and the baby. Other brands I've used are not as easily maneuvered or tightened into place. This fact alone makes this product amazing! 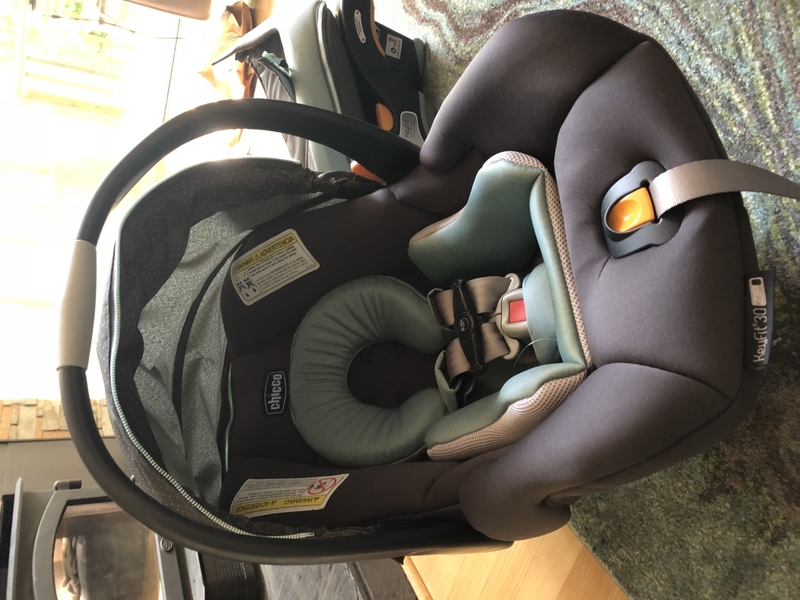 I've been using this infant seat for a couple weeks now and really like the quality of the seat as well as the air zip cover which eliminates the need for a bundle me during the winter months. The seat is lightweight and easy to install in my suv. The seat also clicks into my chicco umbrella stroller and makes it so easy to move the baby without waking her up. Overall I'm very happy with this car seat. Chicco provided this seat for an honest opinion in return. I bought this back in March of 2017, I just upgraded to her big girl car seat, & this car seat has did us some good for the past nine months, great quality, worth every penny!! This infant car seat is great! The base was very easy to install! The car seat itself is very sturdy. I can feel how safe it is! The removable boot is great since I live In Maryland and we have very cold months, but I like that I can remove it for the warmer months. The leather accents make the car seat feel very high end! I love the one-pull tightener on the center of the seat so I know my baby is tight and secure every time. The only semi-negative is this car seat is heavier than my first Graco infant car seat was, but I don't mind because it makes it feel more safe, secure, and durable. Overall I highly recommend this car seat! *Chicco provided me with this product for my honest review. This infant car seat is great! The base was very easy to install! The car seat itself is very sturdy. I can feel how safe it is! The removable boot is great since I live In Maryland and we have very cold months, but I like that I can remove it for the warmer months. The leather accents make the car seat feel very high end! I love the one-pull tightener on the center of the seat so I know my baby is tight and secure every time. The only semi-negative is this car seat is heavier than my first Graco infant car seat was, but I don't mind because it makes it feel more safe, secure, and durable. Overall I highly recommend this car seat! *Chicco provided me with this product for my honest review. I received this as a gift for our little one, before she was born. She's since outgrown it - but it truly was THE best, easiest, nicest car seat ever. She never became sweaty or overheated riding in it, she slept comfortably on car rides, it was SUPER easy to install, LOVED the footmuff, fit my smaller car AND my husband's larger car. We were expecting our third and decided it was time to retire our original carrier. We were convinced to try a Chicco product.The base took no longer than 15 seconds to install: the clips to attach to the car are much easier to maneuver than the ones on our old car seats, the level and spring-loaded leveling feature took away the adjust and look again process, and the Supercinch latch locked everything in place.The seat itself was easy to adjust and the boot is great to keep the infant warm in cold weather without needing to wrap in blankets. The canopy has a nice feature in that it zips to the seat blocking the cold air or unzips to allow a cool breeze. Chicco provided this product to me in exchange for my honest opinion. We were expecting our third and decided it was time to retire our original carrier. We were convinced to try a Chicco product. The base took no longer than 15 seconds to install: the clips to attach to the car are much easier to maneuver than the ones on our old car seats, the level and spring-loaded leveling feature took away the adjust and look again process, and the Supercinch latch locked everything in place. The seat itself was easy to adjust and the boot is great to keep the infant warm in cold weather without needing to wrap in blankets. The canopy has a nice feature in that it zips to the seat blocking the cold air or unzips to allow a cool breeze. Chicco provided this product to me in exchange for my honest opinion. 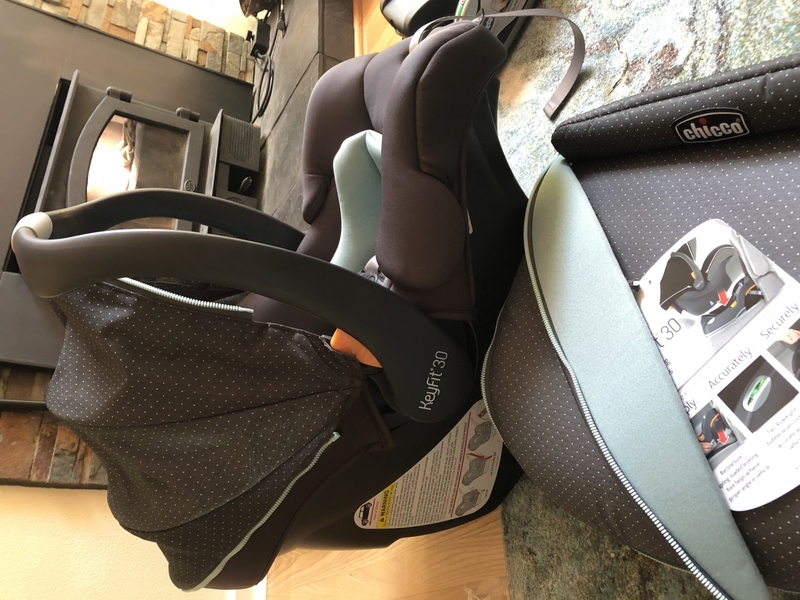 With my previous child I bought the graco set and these are as easy to install, easy to use and I feel like my baby is safer, more snug and secure. Thank you for making such a great infant carseat. We love this seat!! This is the second keyfit we have purchased and the new zip feature makes it that much easier for busy moms to clean! I love this car seat! I am a researcher by nature, so I read a lot about different car seats before deciding on this one. I feel confident in my decision with it being the number one rated car seat by consumer reports. I like knowing that my baby is safe as can be in the car; It's also nice knowing that if she was born small, this seat is recommended by NICU nurses because of it's secure design. There are many color options to chose from, with some of them being gender neutral. The car seat fits in both of our cars with enough room with spare, and it's very easy to remove the seat from the base. The latch system and the level indicators make installing the base a breeze. The straps are easy to adjust/tighten which is definitely a plus because I've dealt with some in the past that were not. Overall, I would highly recommend this product to other parents. Chicco provided this product to me in exchange for my honest opinion. I have not used it for a baby yet, as I'm not due for a few more weeks; however, it is just what I was looking for. It has great safety ratings, the color is spot on and cute (not plain), and it light weight! I love that it has the zip around cover as my baby is due the winter. Best UsesIt is very easy to use and the baby is comfortable. Such a GREAT car seat! This is our second Keyfit30 (first Keyfit30 zip) which is for our 3rd child who is due in the spring. Chicco provided this product to me in exchange for my honest opinion. REASONS I LOVE THIS CAR SEAT:Number one-- It is super easy to install in your car. The instructions are clear, the bubble levels let you know when you've leveled the seat, and the LATCH connectors tighten easily with ONE PULL strap. 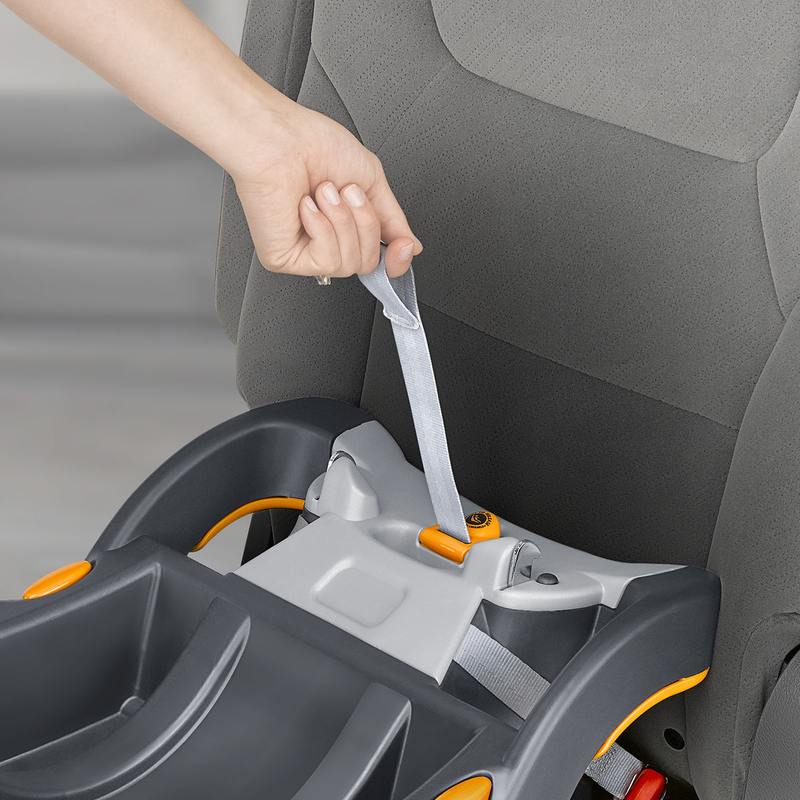 Also, the instruction manual has a storage compartment so you don't lose it if you have look something up (like how to install it in a different type of car or without the base or when baby needs to switch to a bigger seat). My husband and I have joked that Chicco's seats are "marriage savers" because while we've heard other people complain about installing their kid's car seats, Chicco's are so easy to install we don't argue or get mad at each other while doing it. Other reasons I love this seat... --The straps are easily loosened and tightened, AND the shoulder pads are now easily removable! 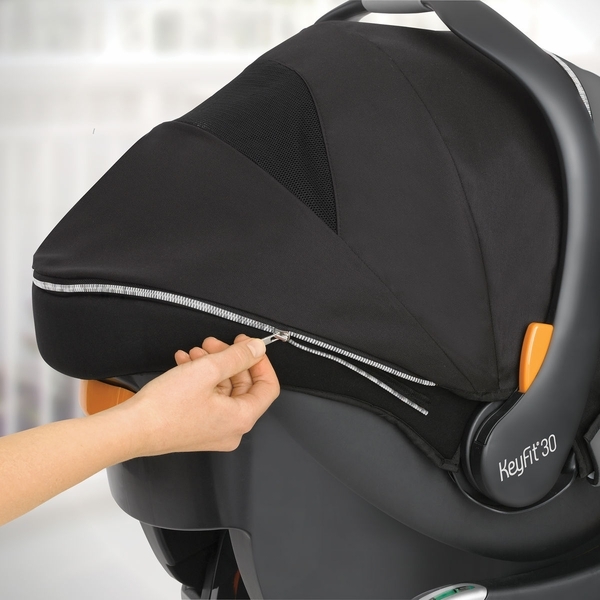 Just unvelcro them and you can toss them in the wash whenever they get drool or spit up on them.--The canopy can be unzipped on the back so that it rotates all the way forward in front of baby's face for when the sun is coming in the back of the car. The visor on the front also zips off or the whole canopy can be removed completely.--It comes with a zip off "boot" which is like a padded blanket for over baby's legs, and won't blow away in the winter wind.--It's quality AND it's pretty. The fabric is soft and plush and not plastic-y feeling. The serene model is a light gray and light turquoise. I think it can easily be used boy or girl.--It comes with all of these features, but doesn't break the bank. Some infant seats can be over $300!--It's compatible with A TON of strollers.OBSERVATIONS/POTENTIAL CONCERNS:--The padding on this car seat is plush, and I remember with our original Keyfit30 that our kids would sweat on their backs in the summer because the plushness didn't allow for a lot of airflow. I will be curious to see if that is still the same with my 3rd child and the new seat come summer. That being said, I know Chicco also makes a "Keyfit30 Zip Air" that is supposed to have a more breathable material on the seat (but maybe that one would be colder in the winter? I don't know.) --When I read a description of the Keyfit30 zip (on another website), I thought the actual seat cover would zip off much like the Chicco Nextfit Zip does. That's not the case. The cover is still easily removable and washable, but it's not with a zipper. Just a heads up in case you read a review on another website like I did. The parts that zip off are the canopy, visor, and boot. This is our second Keyfit30 (first Keyfit30 zip) which is for our 3rd child who is due in the spring. Chicco provided this product to me in exchange for my honest opinion. Number one-- It is super easy to install in your car. The instructions are clear, the bubble levels let you know when you've leveled the seat, and the LATCH connectors tighten easily with ONE PULL strap. Also, the instruction manual has a storage compartment so you don't lose it if you have look something up (like how to install it in a different type of car or without the base or when baby needs to switch to a bigger seat). 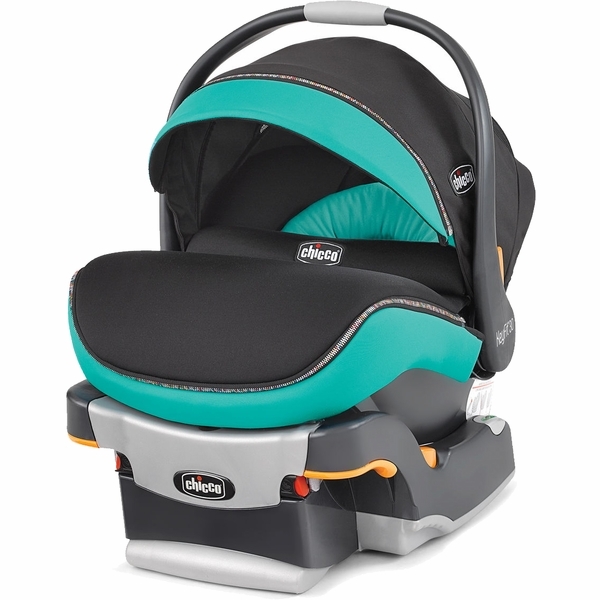 My husband and I have joked that Chicco's seats are "marriage savers" because while we've heard other people complain about installing their kid's car seats, Chicco's are so easy to install we don't argue or get mad at each other while doing it. --The straps are easily loosened and tightened, AND the shoulder pads are now easily removable! Just unvelcro them and you can toss them in the wash whenever they get drool or spit up on them. --The canopy can be unzipped on the back so that it rotates all the way forward in front of baby's face for when the sun is coming in the back of the car. The visor on the front also zips off or the whole canopy can be removed completely. --It comes with a zip off "boot" which is like a padded blanket for over baby's legs, and won't blow away in the winter wind. --It's quality AND it's pretty. The fabric is soft and plush and not plastic-y feeling. The serene model is a light gray and light turquoise. I think it can easily be used boy or girl. --It comes with all of these features, but doesn't break the bank. Some infant seats can be over $300! --It's compatible with A TON of strollers. --When I read a description of the Keyfit30 zip (on another website), I thought the actual seat cover would zip off much like the Chicco Nextfit Zip does. That's not the case. The cover is still easily removable and washable, but it's not with a zipper. Just a heads up in case you read a review on another website like I did. The parts that zip off are the canopy, visor, and boot. It looks even better than the picture and is great quality. I had an older Chicco model for my first child. This one has a significantly better sun shade. I love the cover, especially since its getting cooler outside. ConsA little heavy, I will probably only use it for the first three months or until the baby gets too heavy to use constantly. My first child looked very big in it around four months old so we upgraded to a larger seat. I just purchased this for our baby girl, thinking it was more teal than blue. We just received it and took it out of the box and was sad to see that it's more blue, so much so that I'm going to return it. Chicco doesn't seem to have many options for the girls. My great granddaughter just came home from the hospital in this! Very happy! She's safe! It's recommended by hospitals! if you live where it's hot, Air's the way to go! We live in Tucson; summers are long and hot here. Every time we put kiddo in our previous car seat, she'd come out w/ a drenched back and looking slightly roasted. Some folks we thought should know suggested the KeyFit 30 Zip Air. The change has been remarkable! I think there's only been one day since getting the new carseat that she's been sweaty in the seat (was already hot when she got in). Everything about the seat works smoothly: the base couldn't be easier to install; the seat snaps in and out smoothly and easily every time; and the buckles are easy to un/clip one-handed. So, if you live where it's hot, your kid's gonna thank you for going w/ the Zip Air (once s/he can talk). We got this carseat to replace a Britax B-safe 35 Elite, which was too hot, too heavy, and for which our little one grew too big. The Chicco Keyfit 30 Zip Air is light and airy, the latter aspect being crucial in the heat of the desert summer. Not only does the kiddo stay much cooler, she can also see out better, which we have found she really enjoys (the Britax seemed much more confined around the head, and definitely not as ventilated/breathable). We like that the seat rocks when sitting on the floor; sometimes she'll want to just sit in it while in the house. We live in Tucson; summers are long and hot here. Every time we put kiddo in our previous car seat, she'd come out w/ a drenched back and looking slightly roasted. Some folks we thought should know suggested the KeyFit 30 Zip Air. The change has been remarkable! I think there's only been one day since getting the new carseat that she's been sweaty in the seat (was already hot when she got in).Everything about the seat works smoothly: the base couldn't be easier to install; the seat snaps in and out smoothly and easily every time; and the buckles are easy to un/clip one-handed.So, if you live where it's hot, your kid's gonna thank you for going w/ the Zip Air (once s/he can talk). My 2 week old is so uncomfortable in this seat. Unlike the original keyfit we had for my now 3 year old, the pad only goes part way up their back forcing them into a scrunchy C position. It's awful and we will be figuring out how to return it. Really inimpresssd. 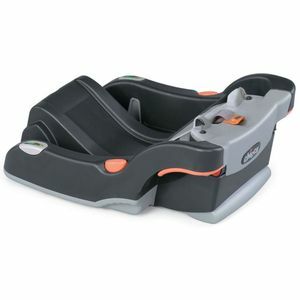 I bought this for my son that was born under 7 lbs and it works great with the infant insert. We just took our son home from the hospital today and did not make a peep from this car seat. He was so cozy and comfy nuzzled against the headrest. My husband said it took 20 seconds to install as well. Great car seat! Chicco products are fabulous. Haven't used it yet but this is my second Chicco! This is my second Chicco car seat. I adored my first and knew I would be getting another Chicco for this baby. I love that the cover is completely removable and it's easy to remove. The baby will be born in August but the cover will be helpful come October when the wind gets chilly. No struggling with a canopy or blanket. I love how easily Chicco is installed and the fabric is so soft! The multicolored zipper was an unexpected and pleasant surprise! The Chicco KeyFit? 30 Base's bubble levels guarantee quick and correct installment from either side of your vehicle and give you confidence that your child is safely secured in your vehicle. The KeFit? 30 Base's "Center-Pull" LATCH adjustment guarantees quick and correct installment from either side of your vehicle and gives you confidence that your child is safely secured in your vehicle. The KeyFit? 30 Base's spring-assisted level foot guarantees quick and correct installment form either side of your vehicle and gives you confidence that your child is safely secured in your vehicle. 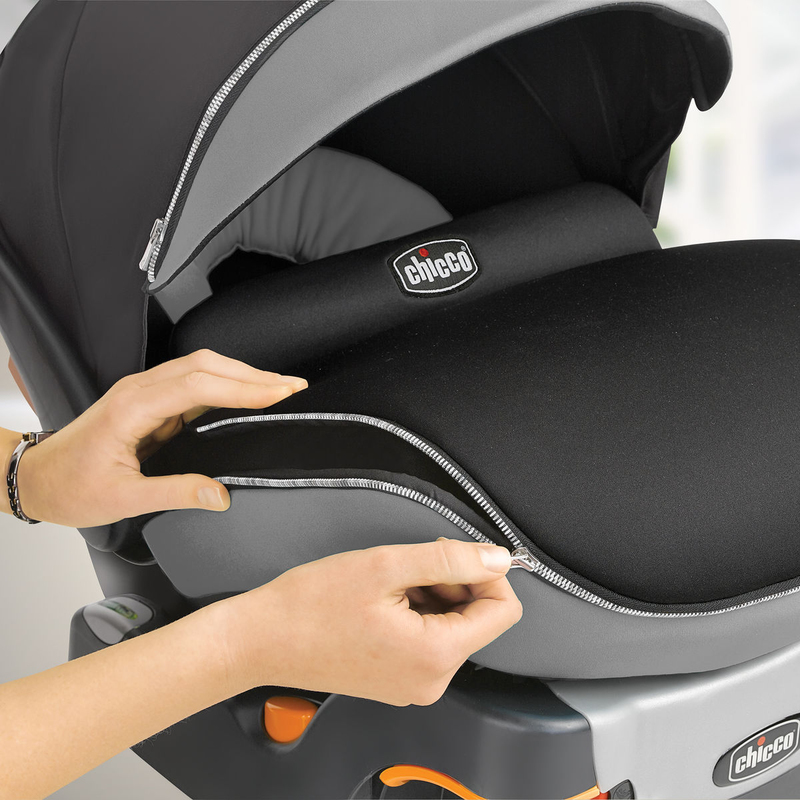 With its removable newborn insert, the Chicco KeyFit? 30 Infant Car Seat will accommodate your baby from four to thirty pounds. The thickly cushioned seat includes a five-point safety harness and is lined with energy-absorbing foam for increased safety and comfort. The #1-rated infant car seat now features premium zipper accents for added style and convenience: zip-off canopy, zip-on visor, and zip-around boot! The KeyFit? 30 Zip also features a quick-remove seat pad that is machine-washable for easy cleanup. One-pull harness tightening and loosening in the car seat allow for quick fitting, and the infant insert gives extra support for a smaller baby. The shell is lined with energy-absorbing foam, and the vehicle base features the ReclineSure? Spring-Loaded Leveling Foot, RideRight? Bubble Level-Indicators on each side of the base, and the SuperCinch? One-Pull LATCH Tightener to help achieve a tight and secure fit! 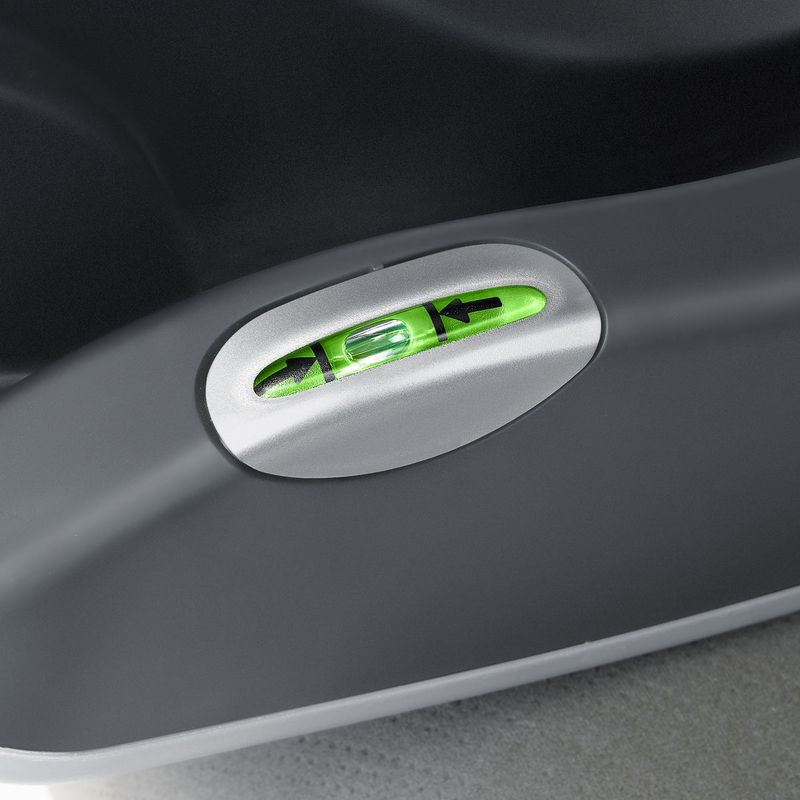 The base also features easy vehicle belt routing and a built-in lock-off system for vehicles without LATCH. An enclosed underside helps protect vehicle seats from damage. Conforms to Federal Motor Vehicle Safety Standard 213. SuperCinch? One-Pull LATCH Tightener with force-multiplying technology to help achieve a tight and secure fit with a fraction of the effort!